India’s terrorist attacks are a watershed moment in the subcontinent’s fragile history—and perhaps for global markets. It doesn’t look like the Mumbai massacre—which has killed more than 100 people and injured nearly 300—will cause the Indian stock market to collapse, but the extremists have targeted tourists and the financial district critical to India’s growth and international standing. But security is often a weak point in developing countries—and the fear of violence can derail otherwise sound economies. The Mumbai attacks add more than political instability to the investment equation. They will make foreigners think four or five times before visiting India. Traders can work from anywhere, but international banks and businesses need people on the ground. 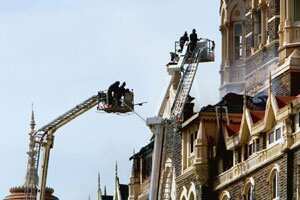 Visiting bigwigs will now be less willing to stay at high-end business hotels like the Oberoi and Taj Mahal, which were at the heart of the attacks. International investors and businessmen can’t expect the Indian government to create perfect religious harmony, but they will want to see that the authorities are fighting back with some success. India has its work cut out to demonstrate that it’s still an attractive place to do business.